I think “creativity” is a little too associated with the free-spirit, artist types. Some of us enjoy manipulating a spreadsheet more than painting a canvas, but that doesn’t make us any less creative. Knowledge workers are highly creative. We’re tasked with developing new products, taking them to market, making our systems more efficient and well, so much more. At the core of it, we solve problems and find new solutions. Creativity is about so much more than art. Unfortunately, knowledge workers are then also susceptible to the same creative blocks that artists complain about. But when you look online for creativity exercises to help breakthrough those blocks, artists dominate the conversation. With this in mind, I’ve come up with a list of imaginative exercises modified for us office-types. When you just can’t seem to figure out what you need to figure out, here are 13 creativity exercises that make sense for knowledge workers. One reason you may be experiencing a creative block is because you are too focused on quality. Quality is a very good thing in an end-product, but it can slow you down in development. You’re unlikely to hit the best quality in early drafts, but if you don’t get past those early drafts in the first place, you will never reach the high-quality end product you’re hoping for. When you’ve hit a creative block because you want something to be perfect, go to the other extreme: quantity. The Exercise: This one is easy; come up with as many ideas as possible — good and bad. If you’re on your own, it’s easy enough to set a timer and challenge yourself to come up with as many ideas as possible in five minutes. If you you want to do this on a team or company wide scale, take advantage of collaboration software. Start a discussion about new ideas, and ask your team to come up with a new idea every day. Encourage people to comment and react so you have a record of what caught your team’s interest and is worthy to move into development. Your workspace matters a lot. Just look at the open space office debate, and you’ll see two sides passionate about what creates a better work environment. For our purposes, it doesn’t matter how your office is designed when you hit your creativity block. Whatever kind of office you work in, try giving it a break. The Exercise: Take your work somewhere new. Most of us can unplug our laptops and work remotely. Take advantage of this. Move your team to a café, have a coffee and work for a few hours in the new location. You can focus this outing around a specific project to foster collaboration or just offer it as a way to mix up the routine. In his book On Writing, Stephen King advises aspiring authors to take a six-week break after their first draft to recuperate. He says that when you spend too much time on a story, it starts to feel foreign. The same could be true for any creative project. If you are falling out of love with your goal, and you’re not able to come up with new ideas to get there, then it might be time to take a break. The Exercise: Plan to get your first iteration of a project done within a short and specific timeframe, and then leave it alone for a while. If you have already worked on your project for too long and have hit your creative wall, take your break now. When you return to your project, you’ll have a fresh perspective to complete it. Think of this like math, if you’re always adding in even numbers, you’ll always get an even result. If you want something odd, you’re going to need a new, odd input. When you hit a creative wall, it might be because you have exhausted all your existing sources of creativity and inspiration and need something new. The Exercise: Find a new source of information you have never seen before. The internet is big and wide. Platforms like Pocket and Mix are great tools for finding publications that are not always on the top of Google News and can help you find your new favorite professional blog. But maybe a new article won’t cut it, and you need something more like a new data set or a new system to process that data. In a case like this, think about what your options are, why your existing options are stopping you, and what you can really do about it. TV remotes are notoriously complicated. These days, it’s possible to find a remote with only the buttons you really need, but it took a long time to get here. I imagine that whoever was responsible for that first design wanted to create something really convenient, but instead, created a remote that confused and intimidated us. Sometimes we get lost in the details and lose sight of what we’re really after. Instead of trying to do more, do less. The Exercise: Create the simplest version of your product. If you’re writing, boil it down to a paragraph, a sentence, and then just two words. Or if you’re developing, reduce what you’re doing to the most core function or wireframe. Doing this exercise will force you to reconsider what you think is necessary and should inspire you to reach your goal in a new way. Have you ever done your best work when you thought it wasn’t possible or right under the deadline? Pressure might be the creative force you need. The Exercise: Write out as many rules as possible, and give yourself a strict deadline. This is especially appropriate if you haven’t been given a lot of direction. Think about what your goals and standards are and write them down as rules. The simple practice of coming up with rules will help you find what direction you need to go. Combining that with a deadline should be enough to get you moving. Most of the time, we try to create something good, impress our boss and win over our customers. But if you are finding it hard to come up with a good idea, try a bad one. I’ll stop there to emphasize that you should not actually show your boss or customers your bad idea. This is just a creativity exercise. The Exercise: Complete an entire project that your boss/customers won’t like. The key here is to be deliberate in choosing what you do, thinking about why they won’t like it. Being sloppy or careless isn’t the point. You want to do what is opposite of what you should be doing, in order to make it more obvious what that is. So much of our work is digital. With tools like project management software, huge teams are able to plan, create and launch grand projects without ever touching anything but their keyboard and mouse. It’s amazing. But when you find it challenging to come up with something new, take it offline. The Exercise: Turn off your computer and attempt to recreate your project physically. I definitely do most of my writing on my computer, but every so often, it helps to pull out a notebook and write with a pen. It forces me to slow down, and there’s no delete key to erase my errors. The new setting brings about new ideas. If you need to move beyond a pen and paper, use everyday objects as models to visualize your process, problem or project. Teaching is one of the best ways to learn. So, why not apply this to your work? You don’t even need a real audience or student. The Exercise: Lock yourself in a conference room, set up a simple web cam or phone to record yourself, and present. To level up, bring a colleague in to watch you too. Presenting your information out loud will help you understand your strengths and your weaknesses. But for this to really happen, you need some form of accountability to keep you on track, articulate and actually finish. That’s why recording yourself is important for this exercise too. And if you don’t figure out what you’re missing while you speak, you’re sure to discover it when you watch your presentation. This one is admittedly more artsy. If you’re not feeling creative within the existing rules, try being creative with the rules themselves. The Exercise: Use online art prompts to put your project in new scenarios. Artprompts.org is a great place to start. You can select different prompt generators like “Situation,” “Character,” and “Environment.” Use the prompt to imagine when people would use your product in a new situation, what the new character would expect in your product, or how the new environment impacts your UX. A book by Austin Kleon titled Steal Like an Artist told everyone it’s okay to disregard copyright. Just kidding, he explained how everything is created with inspiration. The Exercise: Steal your favorite ideas and merge them into your project. Look at what inspires you, identify exactly what you like about it and think of how you can add that to your project. This could be as simple as thinking, “What would my mentor do,” coming up with an answer, and executing. Speaking of taking from others, one common creativity exercise that circulates around the web is called SCAMPER. The Exercise: Gather your team and open a discussion about each of the SCAMPER mnemonic items. Substitute – What can be exchanged for something else? What would that be? Combine – What can be combined in this project? Modify – What can be modified to create more value? Put to Another Use – How else can this project be useful? Eliminate – What can be removed from this project without damaging it? Reverse – How can the project or process be reorganized? This exercise pushes you out of the box in a lot of different ways, and because it’s an organized process, it’s good for group situations too. Hemingway allegedly said, “Write drunk, edit sober.” Regardless of how many times I’m told he never actually said that, it has certain truth that I hold onto. Drinking shouldn’t be your go-to source of creativity, but letting loose a little every now and then is okay. The Exercise: If all else fails and the workday is ending, have a drink. Make sure you bring enough for everyone, toast to creativity, and hope your new ideas will be just as good when you’re sober. At the very least, a happy hour with your colleagues should bring you closer, making it easier to collaborate next time. Feeling creative? Good! Now, as any creative-type knows, you’re going to want the best tools to help you achieve your masterpiece. 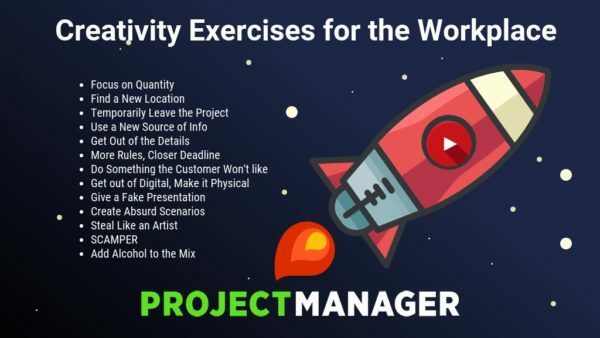 ProjectManager.com is an online project management software that has the features you need to turn those creative ideas into reality. Take this free 30-day trial and get creative!